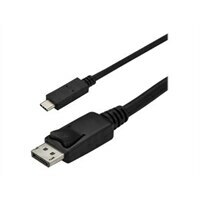 StarTech.com 6 ft / 1.8 m USB C to DisplayPort Cable - 4K 60Hz - Black - external video adapter - STM32F072CBU6 - blackEliminate clutter by connecting your DP over USB Type-C computer directly to a monitor without additional adapters. This USB-C to DisplayPort adapter cable offers a convenient solution for directly connecting your DisplayPort over USB Type-C device to your DisplayPort monitor or projector, at up to 6 ft. away. At four times the resolution of high-definition 1080p, you'll be amazed at the picture quality of a 4K monitor or television. This adapter cable lets you harness the video capabilities that are built into your USB Type-C connection, to deliver the astonishing quality of Ultra HD to your 4K display. Eliminate clutter by connecting your DP over USB Type-C computer directly to a monitor without additional adapters. This USB-C to DisplayPort adapter cable offers a convenient solution for directly connecting your DisplayPort over USB Type-C device to your DisplayPort monitor or projector, at up to 6 ft. away.